The mainsail with its unbattened hollow leach all spread out. Note that this sail has 3 rows of reefing, the storm staysail takes over when it gets beyond this, the boom and gaff can be then strapped down to the gallows and with the small jib the trysail gives enough drive to control the boat in really heavy weather. 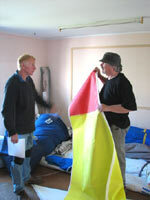 Sailmaker Tony Thornburrow ( left) and builder Charlie Whipple under his famous hat talking over colour and cut for the gaff topsail. 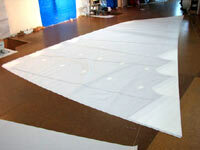 This sail, although small is set right up high and will make a real contribution to the boats light weather performance. This week has been continuing work on the keel, smoothing the laminated deadwood with the little Bosch power plane, cutting and fitting things like the tailpost and the worm shoe. Those are yet to be glued on but are all ready for that when we have a warm day. We spent a day over at the Sailmakers and I was hugely impressed with the work done to date. Tony Tornburrow has a lot of offshore sailing experience in his own 38 footer, and has a particular liking for small cruisers so is putting a lot of extra work into these sails. 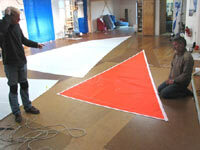 Its nice to have someone with a personal interest in the project doing critical items such as the sails. At this stage there are the staysail, storm jib and storm trysail all seamed up. The main is ready for boltropes and tabling and we were able to lay them out on the loft floor and discuss the details. Tony has made some subtle changes to the cut and shape which I am incorporating in the sailplan, and having that sort of feedback into my plans is wonderful. Note that we do that for each sail type that we sell, I go over to the loft when the sails are all cut and seamed up; we pull them around and look at the shape, discuss the fitting up of the sail and the way the rigging and reefing system works and look at sailcloth types, corner and reefing point reinforcement and things like batten length and so on. 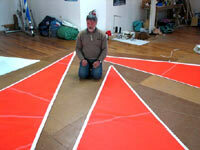 It all helps to produce better sails, and better sailplans in my own work at the drawing board. Tony and I talking over the fitting up of the staysail, there is a set of reefing points on this sail and there are several options as to how the fittings and reef lines will work. With a boat as stable as Sundowner the reef will not be required until its seriously rough so getting the gear easy to use is very important. This afternoon Charlie and I are off into town to buy a sheet of Polyurethane foam, probably 50mm thick and 1200 x 2400. It will become the “plug” from which we will make a plaster mould for casting the lead keel. We will document that closely and keep you posted as it’s a process that is useful for simple castings such as the shallow slab ballast keels on smaller boats, or long simple keels on craft such as Sundowner. Watch this space. Turnover time is not that far off for Resolution, and it's getting close to the time we begin building a cradle in which to turn her. Another landmark happening, and I for one am really looking forward to seeing what the interior feels like when she is upright. Left to right, Storm Trysail, Staysail (that’s the inner jib) and the storm jib. This high visibility 10 oz cloth is made for use as storm sails, its really tough and the sails are constructed very strongly. These sails are as tough as you will see on any boat under about 40 ft long and the highly visible colour scheme is part of the strategy to make a very ambitious voyage as safe as possible. I’ve done more drawings of the bronze work, the last item being the lifeline stanchion base. That part of the job is close to done and then I’m going to complete the detailing of the rig and the rope and block list. This is an exceptionally well detailed set of plans, almost a lesson in boatbuilding in itself. I hate to think how many hours there are in the drawings, but they will help reduce the number of phone calls from builders who are stuck. Few of those who will build this boat will be experienced, and I am trying to answer the questions before they are asked to help them as much as possible. K.I.S.S. . Keep it simple, stupid! I’ve written that on the wall in front of my drawing board!